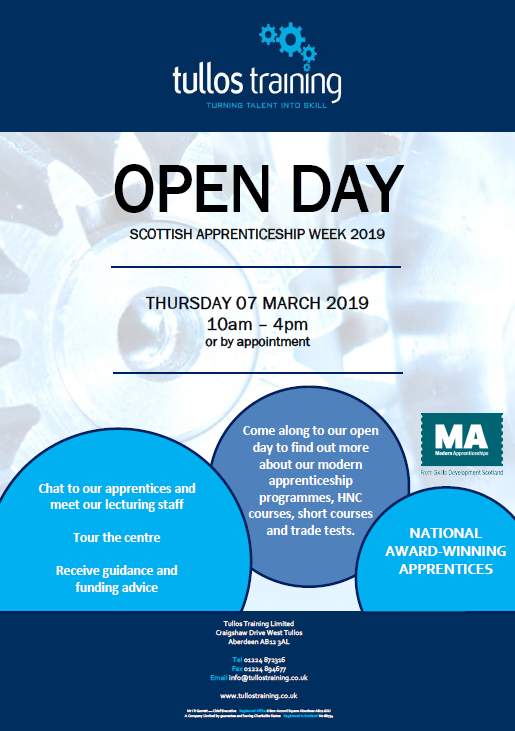 In celebration of Scottish Apprenticeship Week 2019 we have decided to host our annual open day on Thursday 07 March 2019 from 10am – 4pm. The event is open to anyone who is interested in Tullos Training and what we do. This is a great opportunity for anyone interested in completing a modern apprenticeship to find out more about the programmes we offer and how to learn while you earn. You will also have the opportunity to chat to our apprentices and meet our lecturing staff while being given a guided tour of our premises. Our apprentices will all be working hard to complete different sections of their apprenticeships during the open day which means you will be able to see practical demonstrations in all of our departments. We will also have staff available on the day to give you any guidance and funding advice you may require. It is also an opportunity for anyone interested in any of the other courses we offer such as, short courses, HNC courses and trade tests, to come along and find out more information and establish what we can do to meet your requirements.